With the echoing DIMENSION X-X-X-X, you knew you were about to be transported from your mundane, everyday existence somewhere completely different...possibly another planet. Dimension X featured stories from some of the most well-known science fiction writers at the beginning of their career such as Robert Heinlein, Ray Bradbury, Kurt Vonnegut, and Isaac Asimov. The original stories were adapted by script writers, Ernest Kinoy and George Lefferts, as well as contributing their own original scripts. 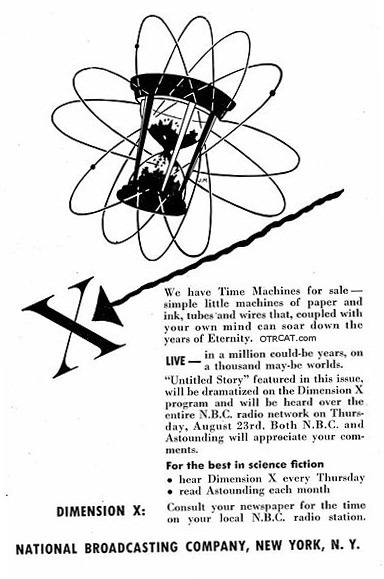 Before Dimension X, only one other adult-oriented science fiction show appeared on radio (Two Thousand Plus) but, with the well-known writers involved, the show had almost instant credibility with science fiction fans. 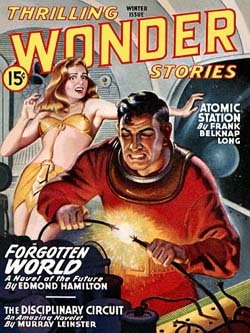 Radio was an excellent medium for science fiction in the 1950s. It was easy to visit other planets, interact with aliens or fly in a space ship in your imagination. It wasn't so easy to bring to life on TV in the 1950s. The show first aired April 8, 1950 and completed its run on September 29,1951 including a five-month hiatus in the middle. There were 50 episodes during the shows run. For American old time radio science fiction shows, seeX Minus One, 2000+, Beyond Tomorrow and Exploring Tomorrow, as well as the classic old time juvenile serials, Buck Rogers. There are also excellent sci-fi compilation available including Robots Collection, Sci Fi Listener's Favorites, Science Fiction Authors Collection, and Aliens, Martians, and UFO's Collection. For additional reading see also: Article on Science Fiction in Radio. x minus one/dimension x absolutely my go to favorite shows. Several episodes of this series are my absolute favorite.